Party Entertainers are great for parties and events in Rochester, IL! Hiring an entertainer for your party can be stressful. You never know who to hire and if they will show up and do a good job. HOB Event Rentals takes all the guess work out of hiring an entertainer. Our face painter is professional, honest, does excellent work, and is great with children. 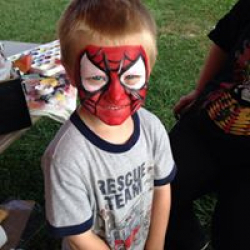 Hiring a face painter is fun for kid’s birthdays and is popular for appreciation events. Click here to see what a face painter can do at your party or event. Add more fun to your event with a water slide rental . HOB Event Rentals is a family owned and operated family company that has been serving Rochester, Il since 2010. Our entertainers arrive early so you can enjoy the full 8-hour party rental. We pride ourselves on our large inflatable and interactive selection, as well as outstanding customer service. When you rent with HOB Event Rentals, you won’t be disappointed. Contact us today! Copyright 2018 HOB Event Rentals. Design by Bounce House Marketing. Powered by WordPress & IO.